Shelter in the Vineyard is a project designed by Ramón Esteve, covers an area of 415 m2 and is located in Fontanars dels Alforins, Spain. Photography by Mariela Apollonio. Shelter in the vineyard is located in the municipality of Fontanars, on the outskirts of the urban area, in an area of large areas of cultivation. The project seeks the maximum landscape and environmental integration, due to its border location between a pine forest area and the vineyards of the farm, practically diluted in the vegetation. The decision to develop the whole program in a single plan, in addition to the materiality chosen, which contributes coherent tones with the place, contributes to this. “This rural shelter takes as a generative idea the traditional typology of rural housing with a gable roof, to apply a new spatial concept”, Ramón Esteve. Its geometry consists of schematizing the perimeter line that defines the traditional house to extrude it later, forming an envelope under which the whole project will be developed. This line-concept, converted into a long shell of concrete, articulates the whole program of the house and is traversed transversally by the rooms materialized as boxes of pine wood. “The volume is composed of two monolithic structures that form two large masses differentiated by their material, one of white concrete, both inside and outside, which is intersected by structural boxes of heat-treated pine wood”, Ramón Esteve. The access to the plot is a path wrapped in olive trees. In the background you can see the house, hidden among clusters of cypresses, poplars and pines. The entrance to the house is through one of the boxes. The central concrete space forms a common fluid area to which the rest of the rooms turn and is presided over a large chimney. Inside, the views are framed in the pine volumes that invades the central space. When conceived as a second residence, both the boxes and the porches are completely closed when the house is not inhabited. A large porch, located at one end, completes the house, offering a rest area linked to a dual landscape. On the one hand, the most immediate views of the pine forest and on the other to the vineyards. 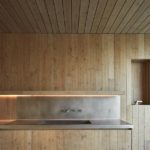 The house is modulated by 20cm boards that build the wooden boxes, and the boards of the concrete formwork. All pine furniture and carpentry have been designed specifically for this shelter following this modulation. The materiality is consistent with the nature of its structure, whether it is white concrete or wood. “Environmentally, it follows the guidelines of a passive house. It has suitable means to take advantage of renewable energies through the use of panels for solar collection, energy supply from biomass or the collection and sustainable storage of rainwater suitable for consumption “, Ramón Esteve. The energy saving is optimized thanks to the materials used and thermal insulation of rock wool with great insulating capacity. Likewise, the installation of lighting is energetically effective due to a control system that optimizes the use of natural light. All the interior architecture has been designed specifically for this project including elements such as cranks, faucets, lighting pushbuttons, chimney … everything is personalized and integrated into the architecture. This entry was posted in bathroom, bedroom, house, kitchen, living, outdoor and tagged bathroom, bedroom, house, house idea, houseidea, kitchen, living, myhouseidea, outdoor, Ramon Esteve, Shelter in the Vineyard, villa on January 9, 2018 by admin.